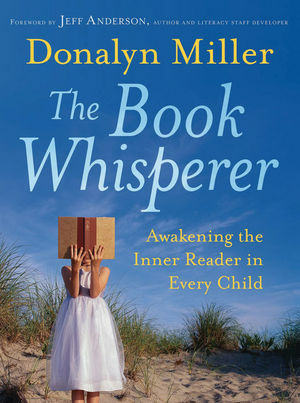 I just finished Donalyn Miller’s The Book Whisperer. Reading her take on current classroom reading practices (too many engineered and guided by textbook publishers) and how her philosophy conflicts with those practices was both affirming and challenging. I’m heartened to know that some of what I do in reader’s workshop is being done in many other classrooms and is supported by a wealth of current research. Donalyn challenged me, though, to rethink some of the strategies I use that don’t provide as much bang for the buck or advance a student’s love of reading. Throughout the book, Miller places a very important question – what is the desired outcome of our reading instruction? Are we teaching so students can pass a test, or are we molding life-long readers and learners? I side with creating life-long readers. Readers are learners; they use books to make sense of the world, themselves, and others. They also use reading as an escape. And who can blame them. Rather than teach students that reading is all about completing the project at the end of the unit, writing the book report, answering the comprehension questions, or even pacifying a teacher (or parents for that matter), we really need to focus our efforts on teaching the standards within the confines of each student’s reading interests. Meet students where they are. For some this may involve a fair amount of prodding. For others, this will mean upping the ante and challenging them to investigate different genres. For many, this will involve listening to and respecting their reading interests, reading with them, and modeling the characteristics of a good reader. All of these cases will involve reading lots of young adult literature and non-fiction.